Marysia has been a Soul Food Sister since 2012 and helped set up the social enterprise after participating in a cross cultural cookery group that successfully took over of the kitchen of a Merchant City restaurant in the same year. Marysia’s dad showed her the ropes in the kitchen but she is largely self-taught and specialises in Polish dishes. She’s motivated by the transformative power of collective effort and seeks to use the power of the kitchen to spark a social revival in Govanhill. Over the last few years, Djamila has been involved with Glasgow organisations such as Scottish Refugee Council, Karibu, Scottish Refugee Policy Forum. She enjoys the confidence she’s gained through Soul Food Sisters, as well as meeting women from different backgrounds with a shared interest in healthy food and helping others integrate in Glasgow. 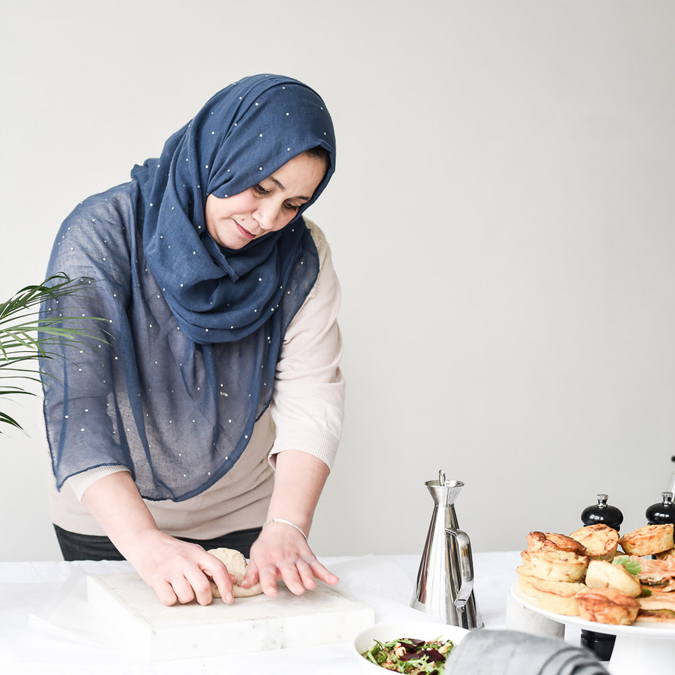 Originally inspired by her mother to cook traditional Algerian recipes, since moving to Glasgow Djamila has discovered new dishes through the people she’s met. That said, her favourite recipe is an Algerian classic: traditional couscous with meat and baklava. Kalina has been cooking for many years and her dishes are influenced by both her Romanian roots and her husband's Pakistani cuisine. She is a full time mum, looking after her young son, and enjoys making pakoras, curry and sarmale. Her favourite dish to cook is a traditional Romanian schnitzel with fried potatoes. Kalina joined Soul Food Sisters as she loves teaching and learning new culinary skills and wants to work with women and share new experiences. Originally from Eritrea, Joumana has a breadth of knowledge in Eritrean, Indian and Saudi cuisine and learnt much of this from cooking with her mother. Her favourite dish to make is either fish or chicken curry. She previously worked as a beautician and tailor when she lived in Saudi Arabia, but is now studying english in Glasgow. Joumana hopes to expand her skills and learn how to make dishes from around the world by meeting and working with other women through Soul Food Sisters. Inspired by our goal of making a positive social impact on the lives of migrant women, Vivienne joined as a sister earlier this year. She learnt to cook through watching her mother prepare healthy meals for the family and has fond memories of going to the street markets in Hong Kong shopping for fresh local ingredients. Through Soul Food Sisters she wants to develop opportunities for migrant women to gain confidence and feel empowered to develop themselves. Since recently becoming vegan Vivienne has been exploring a new range of dishes and her current favourite is a spicy tofu dish called Ma Po tofu. Racheal has in-depth experience in managing a diverse range of projects within the arts and culture sector of Scotland. She is a History of Art graduate from the University of Glasgow with prior education in film & television. Racheal is currently the Programme and Building Manager at The Kinning Park Complex, an independent community and arts centre in Glasgow, where she manages the vital day to day operations of the organisation which aims to both fundraise and run community development projects.